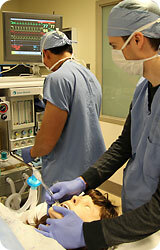 The Division of Obstetric Anesthesia at the University of Washington Medical Center (UWMC) provides a one-year faculty-fellowship in Obstetric Anesthesia (OBA). During this year fellows will learn and practice state-of the-art clinical care, including expertise in labor analgesia and the anesthetic management of high risk pregnancies. For those interested in research extensive opportunities are available. The obstetric unit at UWMC is a tertiary referral center for the five WWAMI states (Washington, Wyoming, Alaska, Montana, and Idaho). This results in an extremely diverse, high-risk patient population. In 2015 the UWMC had the second highest UHC APR-DRG Severity of Illness Score for all deliveries in the country. The division works closely with all divisions of medicine to provide an integrated team approach to manage complex cases. The UWMC has an average of 2400 deliveries a year, with a 41% cesarean section rate and an 85% CSE/epidural rate. Placental Abnormalities suchs as Placenta Accreta, Increta, Percreta And Previa. The fellows will be highly encouraged to initiate and/or participate in clinical research and/or basic science research. For those involved in a research program, a two-year fellowship is possible. Fellows are expected to present their research to the department as well as at appropriate national meetings. The fellow is expected to take an active part of all the divisions teaching efforts for the residents on the rotation. Faculty lecture on a daily base, while workshops and boot camps, located at the WWAMI Institute for Simulation in Healthcare (WISH), take place on selected dates. Presentations to other obstetric providers, such as obstetric residents and fellows, as well as nurses, may also be required later in the year. Involvement in the WWAMI Institute for Simulation in Healthcare (WISH) will be part of the fellow's responsibilities. Education takes place via clinical practice, supervised by an Obstetric Anesthesiology Attending, various didactics sessions, as well as reading recommended textbooks and publications. Attendance of local and national meetings is also vital to the educational process. 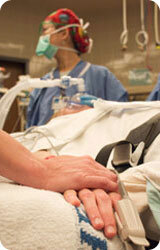 Presence at the weekly Wednesday morning Department of Anesthesiology Grand Rounds (6:30-7:30AM) is expected. All fellows will be encouraged to participate and present at the Society for Obstetric Anesthesia and Perinatology (SOAP) and the American Society of Anesthesiologists (ASA) annual meetings. Meeting time and academic allowance will be provided for at least one conference (SOAP preferred). 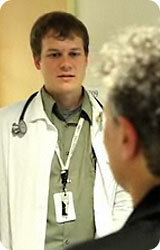 Faculty fellows work as an acting instructor an average of two clinical days per week in the main OR. The rest of the week are “Fellow Days”. These Fellow Days are mostly spent on the Labor & Delivery floor, but also in the OBA High Risk and IVF Clinics. Research time is part of these Fellow Days. After and introductory period, faculty responsibilities include three 15 hrs over night calls per month in the capacity of the on-call attending anesthesiologist on the obstetric unit. Serves as an attending anesthesiologist on the obstetric service with night and weekend call (3 overnight calls/month, 1 weekend/holiday call) –after introductory period; with an OB anesthesia attending as back-up. The OBA fellow will have continued support, mentoring and supervision by the the Chief of the division. Professional Interests: Ultrasound guided regional anesthesia, obstetric anesthesia, pharmacology, acute post-operative pain, as well as novel clinical strategies to predict, diagnose and prevent chronic pain in a targeted manner. The application process for all the faculty fellowships requires that interested applicants send the following information by mid-summer (i.e., end of August), with anticipated starting date in fall of the following year. Applicants are best considered for the next year’s fall entry if their application is complete by mid-summer (i.e., all documents submitted by Aug 31, 2018 for consideration for Fall 2019). Please Note: The application process for positions beginning in the fall of 2018 has been closed. The next deadline for applications to the faculty fellowship program is September 1, 2018 for positions beginning in the fall of 2019. Reaching out to our faculty at the annual SOAP meeting is highly encouraged.